The most common Bat found in Virginia, Washington D.C., Maryland and West Virginia is the Gray Bat. It is a medium sized short-eared bat with short, soft, gray-brown hair. They weigh 1/4 to 3/8 ounces and have a total length of 3-4 inches. 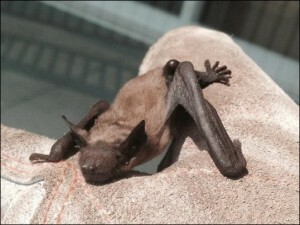 The little brown bat has dark yellow-brown to olive brown fur. It weighs 5-14 grams and is typically 85-98 mm long. Their typical life expectancy is 2 years for males and 2-3 years for females. Moths are a major part of their diet as well as midges, mayflies, and aquatic insects. The eastern small-footed bat is rare in Virginia but has been spotted on occasion. They are found in heavily wooded areas and mountain regions but do not exclusively live in caves. Their length is between 2 7/8 and 3 1/4 inches and have chestnut brown fur with black accents. Small footed bats have a life span of around 12 years and their diet consists of mosquitoes, small beetles, true bugs, and ants. Northern long-eared bats are medium sized with brown fur with their stomachs being a lighter color than their back. Their length averages 79-100 mm and their wingspread is between 228-258 mm. The average weight of an adult Northern long-eared bat is around 5-10 grams. This species forages on mainly hillsides and in forests in search for small insects, especially flies. The Eastern pipistrelle is one of the smallest bats with its total length being 2 3/4 to 3 3/4 inches. Their yellow-brown hair helps distinguish them from other bats. The typical life span is 4-8 years, which they spend in caves and rock crevices while living on a diet of moths, grasshoppers, beetles, wasps, and flies. The big brown bat is one of the larger bats with a length of 103-130 mm and a weight of 13-18 grams. This bat can be found throughout Virginia and is one of the most common bats to enter a house through the fireplace. Their diets consist of insects. Virginia big-eared bats average length is 90-112 mm and the average adult weighs 9-12 grams. Their huge ears are joined across their forehead. They have long brown fur with their dorsal hairs being dark brown on the tip. During their life span of up to 16 years, they will feed on mostly corn, alfalfa, and insects. The southern myotis has a very similar appearance to the little brown bat but can be distinguished by its shorter, thicker fur that is gray-brown or orange. They are usually 77-97 mm long and weigh 5-8 grams. The southern myotis prefers hollow trees for shelter where it can easily find insects to eat. Silver haired bats live up to their name with long brownish-black silver-tipped fur that covers their 3 3/4-4 5/8 inch long bodies. Their life span of around 12 years is spent setting up habitats around steams and rivers to have their young while looking for insects to eat. Medium sized eastern red bats have a total length of 3 1/2 to 4 3/4 inches long with red to rusty fur. This bat is common throughout Virginia and lives in hollow tree where they feed on beetles, cicadas, and crickets. The hoary bat is the largest in the region with a weight of 3/4- 1 1/4 ounces and a length of 4 7/8 to 5 5/8 inches. The light brown hoary bat typically feeds on moths, mosquitoes, dragonflies, grasshoppers, and wasps. The evening bat can be seen mostly in the eastern part of Virginia in the Piedmont Region where they feed on insects. Their 75-105 mm bodies are covered in sparse brown fur that makes them resemble the big brown bat. For other questions regarding bats, contact Animal Control Solutions at 703-881-3170.